we don't stop borrowing money from foreign creditors. Before the financial crisis of 2008/2009, America was caught up in a huge debt-financed spending boom. Our trade deficits were soaring out of control simply because we continued to consume more than we produced. The debt to finance this consumption piled up in the form of mortgages and the federal deficit. It enabled the housing boom, which in turn created the structured-finance debacle that wrecked AIG and wiped out Bear Stearns and Lehman Brothers. No less a person than legendary investor Warren Buffett warned in 2003 that our national preference for consumption rather than thrift would eventually ruin our currency and spark a financial crisis. He was particularly worried that we were now borrowing and spending so much that we had become dependent on foreign creditors. He described the situation in an article he wrote for Forbes magazine called "Squanderville vs. Thriftville." Buffett warned that we would inevitably grow poorer relative to the rest of the world and our creditors would grow wealthier. As he wrote... I'm about to deliver a warning... our country's net worth is now being transferred abroad at an alarming rate. A perpetuation of this transfer will lead to major trouble. And so it did. We borrowed so much money that during 2004, 2005, and 2006, finance companies earned more than 40% of all the profits in the S&P 500! When 40% of all the profits in our economy relate to finance charges, we have a society that has gone mad. We turned our country into a kind of giant ATM... that was dispensing the savings of foreign investors. It was this borrowing and spending... this constant consumption far, far above our ability to produce... that was the root cause of our financial problems. There is no other, more basic and accurate way to understand the real fundamentals of what happened. Buffett explained in his Forbes piece what was happening. In effect, our country has been behaving like an extraordinarily rich family that possesses an immense farm. In order to consume four percent more than we produce – that's the trade deficit – we have, day by day, been both selling pieces of the farm and increasing the mortgage on what we still own. Plenty of people (especially U.S. politicians) constantly say these deficits don't matter, that we owe it to "ourselves." That's simply not true, as Buffett pointed out, 10 years ago: "The rest of the world owns a staggering $2.5 trillion more of the U.S. than we own of other countries. To put the $2.5 trillion of net foreign ownership in perspective, contrast it with the $12 trillion value of publicly owned U.S. stocks." Paying foreigners rent (or interest) on these assets will undermine our wealth and our standard of living. "As foreign ownership grows, so will the annual net investment income flowing out of this country," Buffett explained. "That will leave us paying ever-increasing dividends and interest to the world rather than being a net receiver of them, as in the past. We have entered the world of negative compounding – goodbye pleasure, hello pain." Now... I'm going to give you some data points below. But you don't really need any facts to answer the following key question: Over the last five years, has anything material changed about the way of life and the nature of our economy in the United States? Have we begun to actually produce more than we consume? Have we stopped being a society obsessed with consumption? Have we stopped the madness of our debt-fueled spending binge? Have we learned anything from the crisis and changed our financial, cultural, or moral excesses? 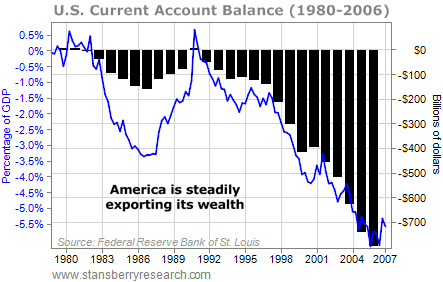 A few facts: Since the fourth quarter of 2009, the U.S. current account deficit has been more than $100 billion per quarter. As a result, foreigners now own $4.2 trillion more U.S. investment assets than we own abroad. That's $1.7 trillion more than when Buffett first warned about this huge problem in 2003. Said another way, the problem is 68% bigger now. And here's a number no one else will tell you – not even Buffett. Foreigners now own $25 trillion in U.S. assets. And yet, we continue to consume far more than we produce, and we borrow massively to finance our deficits. Since 2007, the total government debt in the U.S. (federal, state, and local) has doubled from around $10 trillion to $20 trillion. Meanwhile, the size of Fannie and Freddie's mortgage book declined slightly since 2007, falling from $4.9 trillion to $4.6 trillion. That's some good news, right? Nope. The excesses just moved to a new agency. The "other" federal mortgage bank, the Federal Housing Administration, now is originating 20% of all mortgages in the U.S., up from less than 5% in 2007. Student debt, also spurred on by government guarantees, has also boomed, doubling since 2007 to more than $1 trillion. Altogether, total debt in our economy has grown from around $50 trillion to more than $60 trillion since 2007. Perhaps we could afford these obligations if our productive capacity was also expanding rapidly. But it's not. Since 2007, production on a per-capita basis has declined. Real, per-capital GDP in the U.S. at the end of 2007 was $43,635.59. As of the end of 2012, it was $43,063.36. One big reason productivity is falling: More Americans than ever aren't working. Today, more than 90 million Americans are not in the labor force. That's 13% more people not working than in 2007. Who is working? The government, which doesn't produce anything. We estimate total employment in the federal government has increased by nearly 400,000 since 2007 – or roughly 10%. Officially, the new hires number is 276,000, but we know between 100,000 and 200,000 National Security Administration/CIA contractors are not being counted. What are all of these lovely people doing to serve us? Mostly writing new rules for us to follow. There were 22,771 pages of federal rules and regulations in 2007. Today, there are 27,274 pages of rules for you to follow – 20% more rules in only six years. And how will these new employees and these new rules help us solve our core spending problem? My bet is they won't. Nothing has changed whatsoever about the root cause of the financial crisis. We still have massive amounts of debt, far too much to safely finance. We still continue to borrow larger and larger amounts, as if nothing at all went wrong. So today, once again, financial firms' profits make up a huge, disproportionate amount of the total profits of the S&P 500 (20%). And it's not just us. In the European monetary union, government debts totaled 66% of GDP in 2007. Today, they're more than 90%. In the United Kingdom, government debt equaled 43% of the economy in 2007. Today, it's also at 90%. Unbelievably... no one in the developed world seems to be able to generate wealth anymore, only more debts. To finance these debts, we continue to sell parts of our "farm" to foreigners. By doing so, we will become much poorer over time. Ten years ago, the combined economies of Brazil, Russia, India, and China (the so-called "BRIC" nations) equaled roughly 29% of our economy. By 2007, their economies were equal to 53% of ours. Today, they equal 91%. Our borrowing is fueling their boom. Buffett warned this would happen. And he was right. He also warned what would happen after we racked up all of these debts: Sooner or later the Squanderville government, facing ever greater payments to service debt, would decide to embrace highly inflationary policies – that is, issue more Squanderbucks to dilute the value of each. That prospect is why I, were I a resident of Thriftville, would opt for direct ownership of Squanderville land rather than bonds of the island's government. Most governments find it much harder morally to seize foreign-owned property than they do to dilute the purchasing power of claim checks foreigners hold. Theft by stealth is preferred to theft by force. Buffett was right again. In 2009, the Federal Reserve began to massively monetize the U.S. debt, allowing the U.S. Treasury to issue more debt and repay existing debt by simply selling it to the Federal Reserve (which creates the funding for such purchases by printing the money). The Fed has since printed up about $3.5 trillion. And recently, it promised to keep doing so. As a result, since 2007, M2 – a basic measure of money in the U.S. economy – has increased by 38%. And so... what are our foreign masters doing? They're dumping Treasurys and buying U.S. assets. Chinese firms now own IBM's personal computer division, the AMC movie-theater chain, pork producer Smithfield, plus some of our most valuable new sources of energy, via equity deals with Devon Energy and Chesapeake Energy. 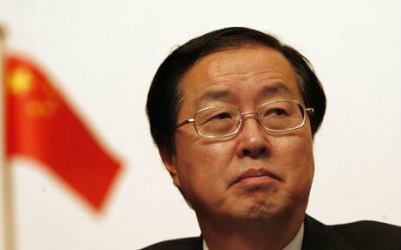 So far in 2013 alone, China has spent $10 billion on U.S. assets, compared with less than $1 billion in 2008. Our foreign masters will soon begin buying massive amounts of U.S. property, as they move their holdings from the obligations of Freddie and Fannie into the underlying assets. In 2012, the Chinese bought $3 billion of commercial real estate in California. Soon, I believe they'll begin buying huge packages of U.S. residential houses. Thus... in three or four years... millions of Americans will literally be paying rent to the Chinese. It will absolutely happen. The next time you think about saying you're grateful to the Fed and to OBAMA! for "bailing out" the U.S. economy, I hope you'll think again. All they've really done is push the inevitable collapse of our economy further into the future... by selling off our country's greatest assets to our chief economic rivals. This, my friends, is truly the worst possible outcome. Just imagine what country we'll have left in another 20 years. I believe this will be our end: Our foreign creditors will lose faith in our ability to repay these enormous debts. They will dump their dollar holdings and America will lose its coveted reserve currency status. The dollar will lose more than half its value... probably all of it. Although the forces that cause huge currency movements will end up bankrupting the majority of Americans, most people don't even know they exist. You won't learn about them from your parents. You won't learn about them from your friends. Even business classes at top universities are largely useless for learning these forces. This is an enormous problem... one that could have catastrophic consequences for your wellbeing. As the U.S. government's reckless monetary policies drive us toward financial ruin, knowing about these hidden forces could mean the difference between bankrupting your family or safely making a fortune. Dr. Steve Sjuggerud, has studied and written about currencies for nearly 20 years. In fact, his PhD dissertation was about how currencies move. In his presentation, he details how these forces work and their impact on every American. He also reveals several unique trades that will allow you to safely build a huge amount of wealth in the midst of currency fluctuations... including what he's calling "The Greatest Currency Trade of the Next 10 Years." While Steve's recommended trades are related to currency movements, none of them involve risky, leveraged currency bets, like most people think of when they hear "currency trade." These trades don't involve traditional currency trades at all (and all but one can be easily made in a conventional brokerage account). Out of fairness to Steve, we can't say much more about this report here. The most important thing to remember is that big currency moves can cause huge "ripple" effects in your life. There's no escape from currency fluctuations. Even if you own a simple bank account, you are "long dollars." Your wealth is tied to the movements in the U.S. dollar. Steve understands these forces better than anyone. He knows that stuffing money under your mattress won't save you from these powerful forces. He understands that you must harness the power of currencies if you hope to generate and grow your wealth in the coming years. We're at a major crossroads in the currency markets. Our government is in a "no way out" situation with its finances. You can't afford to sit on your hands and watch your purchasing power decline.